How can SEO content writers produce effective content in an industry where they hold no experience? Then, they need to uncover search opportunities in the form of great topics and keywords to target in a piece of content. They will also need to develop a thorough understanding of a specific topic through extensive research and reading. Finally (and most importantly! ), the content must meet searcher intent and be geared to fulfilling specific business goals. Despite its overuse, It’s a fair question. Business owners take pride in their years of experience, learning and course-correcting at the helm. I can understand being wary of bringing in an industry outsider—especially when this involves producing effective content aimed at reinforcing the brand and bringing in new leads. But today, we’re going to erase those fears by answering the question once and for all. If you’re a content marketer or an SEO content writer, this post will give you all of the ammo you need to rattle off a mic-drop answer when someone asks the inevitable question posed above. In order to understand the differences between industry ‘insiders’ and ‘outsiders’ regarding their ability to produce effective content—it’s important to consider the perspective of each group. When it comes to a business owner, what does it mean to be successful, and how can the benefits of content marketing be measured? How about an SEO content writer? What does success mean to me with a given client? It’s logical that having placed a large financial investment in getting the roller coaster up and running, the business owner would want to aggressively promote it as the hottest new attraction in town. They would want new content to focus on all of the coaster’s state-of-the-art features, like the fact that it reached 100 mph and has the tallest drop in North America. Well sure, it’s cool, but is that topic going to drive results from organic search? Probably not. Getting more visitors to pay admission to the theme park and walk through the doors. Once they’ve done that, they can ride the Lightspeed Roller Coaster, which I’m sure is very impressive. It’s fairly simple to understand that our theme park owner wants to get more people to the park. Maybe he wants to increase bookings of group events, birthday parties or field trips, which all bring large quantities of kids to the park. Ultimately, the livelihood of their business depends on the amount of people who walk through the doors each day. Because of this, good content marketers will begin their work with the goal of increasing the number of paid visitors seeking out the types of attractions offered at the park. This involves researching high-opportunity keywords that are pertinent to the industry as well as the business goals of the client. In this case, a content marketer could research the keywords that people use to find fun or interesting things to do in the area. Keyword research is just the start. It’s important to analyze the business opportunity presented by each keyword. If a keyword does not provide business opportunity, it can still be valuable in driving traffic to the website if it has high search volume from a relevant audience. For example, a post titled “25 Amazing Birthday Party Ideas In Minnesota” is informational in nature but has the potential to be transactional, if you link to your own theme park in the piece. This step is a comprehensive search of influential websites and resources around the internet who could benefit from linking to the eventual content you create. By earning backlinks from authoritative websites, a piece of content instantly becomes more valuable as a major traffic-driver to its website. This increase in authority driven by inbound backlinks plays a major role in boosting the search rankings of the entire website, making link-building the most sustainable and effective SEO strategy. Once a content marketer has chosen the keywords an eventual piece will target, it’s time to drill down into the actual topic, and how it will be presented. This post would include the types of information, identified through research, that the people planning such events want to know. It even touches on extra benefits for visitors, like an event planner to make booking easy or a lunch facility. This post would target the transactional keywords most closely linked to booking a group visit to the Lightspeed Roller Coaster, while covering the main topics or questions for which searchers have demonstrated a need for more information. Writing about “The Top 50 Field Trip Ideas For Middle Schoolers” offers high utility, so it is much more likely that the post will earn backlinks with appropriate promotion efforts. A mention of the new attraction may be included in this piece, but the post's focus is much more about providing a useful resource to readers, increasing the number of backlinks to the website, and then funneling this page authority to pages that generate leads or transactions. Option A is the piece the theme park owner is probably expecting you to come up with, and there’s nothing wrong with occasionally peppering transactional, targeted pieces like this into a larger content strategy. In fact, this type of content is great as an informational resource for people who already know about the theme park. It can help answer any question they may have, and could even be the deciding factor in whether or not they decide to visit the park. But ultimately, this piece won’t go far if the intentions are to boost traffic to the website and increase web leads. The focus is too narrow and promotional, and it will not attract backlinks from authoritative websites. Option B has a much stronger chance of driving targeted traffic to the website and gives you the opportunity to add authority to important transactional pages on the website once you’ve earned some valuable backlinks. While it may be tougher for your client to understand because it isn’t an outright promotion of the theme park’s attractions, SEO content writing isn’t about outright promotion. It’s about understanding what people are searching for and providing the best possible resource to satisfy that need. More on that later. For many content writers, this is the hardest part, because it takes a lot of work. But we never said content writing wasn’t a labor intensive process, right? In fact, when engaging content writers, businesses should know that while writers don’t come with a wealth of industry knowledge, they’ll be developing it in droves as they go. Once the writer has identified a set of keywords and the right topic, it’s time for them to become an expert on a microcosm of the industry. This includes extensive reading of industry resources, conversations with the client, and competitor research. Once this self-education phase is complete, a writer can complete an effective piece of content. The graphic below serves to explain how a content writer can succeed without knowing all of the ins and outs of the industry. The funnel represents a lifetime (or a least a career’s worth) of industry experience, held by a business owner or a marketing manager at a particular company. As a content writer, you can’t possibly hope to waltz in with such a vast knowledge base. The small circle within the funnel represents the knowledge necessary for one piece of effective content to be created. In our example, while the theme park operator ultimately knows more about roller coasters, the content marketer knows more about how to use the theme park's blog to meet business goals. By leveraging the right research to develop a thorough knowledge of a specific topic within the industry, a content writer can create a comprehensive, industry-leading piece of content that drives traffic and helps the website produce leads. It’s pretty easy for a business owner and a content writer to get on the same page when it comes to goal-setting. Often, it’s as simple as having a conversation about how the business wants to grow and what needs to be done in order for that growth to happen. We’re all in agreement there. But how content addresses these goals is the real challenge—and that’s where a content writer with an understanding of searcher intent can outshine a 30-year industry veteran. Every single internet search is typed or dictated with a specific intention. The deployment of Google’s RankBrain machine learning algorithm over the past few years has created a paradigm shift in search. Google knows there’s an intention behind your search query—and it strives to know what that intention is rather than giving you a SERP full of random listings that rank for the keyword you typed in. Because of this, search is becoming increasingly nuanced as intention holds more weight than specific word use. On the most basic level, if I type in “movie times Minneapolis,” Google will understand that I’m looking for a list of movies and showtimes at theaters near me. It’s crucial to understand the searcher intent of the keywords you’re targeting in a piece. And it’s crucial that the piece you create is relevant to what Google interprets that searcher intent to be. How does understanding searcher intent lead to better content topics? Since our client wants us to write about roller coasters, let’s do some quick keyword research on roller coasters. Through our research, we find that the keyword “best roller coasters” has great search volume and is relatively uncompetitive. Creating a piece of content on “the best roller coasters in America” seems promising, based on the keyword data’s demonstration of amount of traffic it could drive. In fact, none of them are local, so unless a reader happens to be from your area and comes across the post, you won’t be getting more foot traffic. 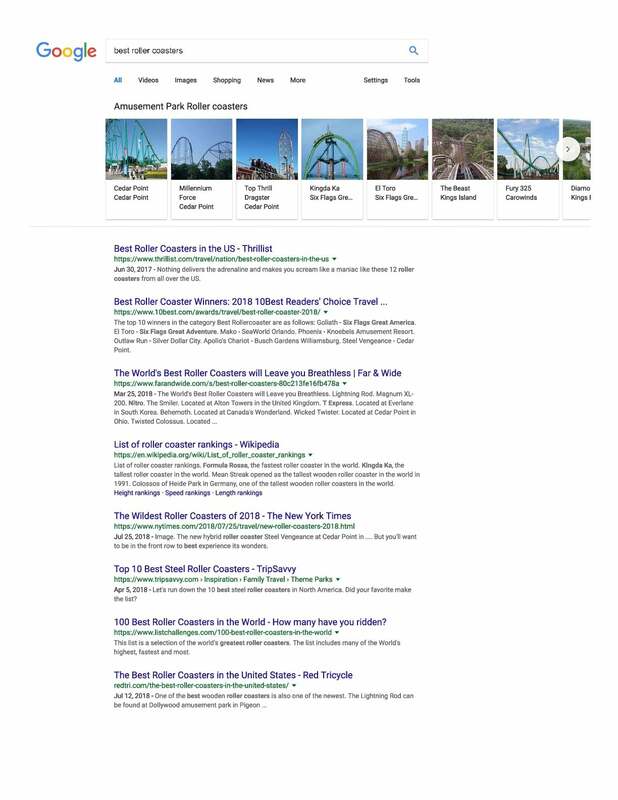 Sure, you could go the completely informational route and try to create the best post of the bunch in an effort to earn backlinks, but why go that route when some of the listings have as many as 100 different roller coasters on their list. Sounds like a lot of effort for very little reward. As group events are one of the most profitable aspects of your client’s business, why not base our piece on a keyword that’s more pertinent to company objectives? As we can see from the results, the search volume isn’t quite as high, but the keyword competitiveness is a bit lower. The “field trip ideas” search looks like it’s much more likely to attract a local paying customer. While some of the results are informational, it seems as if Google has understood that this keyword is more likely to be typed in by a user who is genuinely looking for field trip ideas near them. 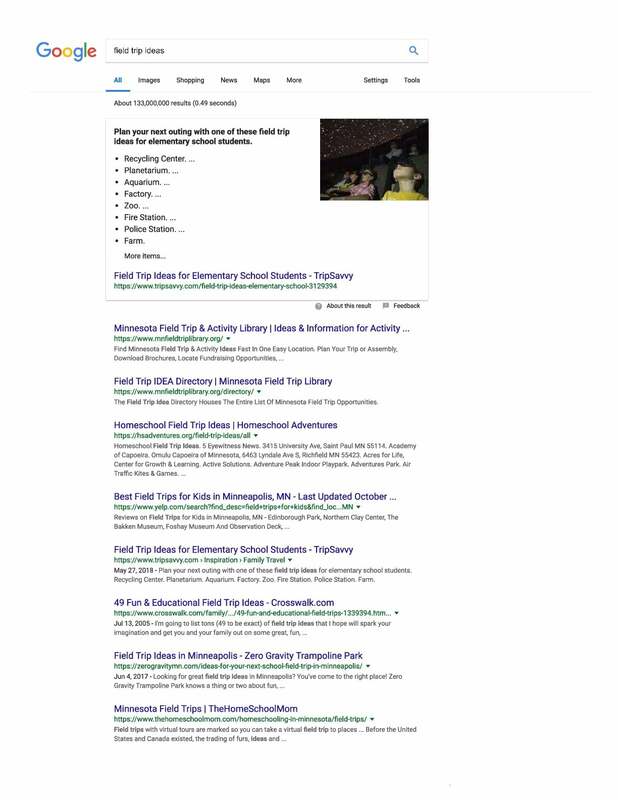 In fact, Google automatically applies a geofilter showing results in Minnesota, as well as including SERP features that show appropriate MN locations. Again, from the amusement park's perspective, writing about how their new roller coaster is the best seems logical. It's a unique selling proposition, and it provides something novel to talk about. However, the niche topic of 'field trip ideas' is a more worthwhile focus for content creation. Google has used its understanding of searcher intent to provide results with transactional implications to users who may have the intention to book a field trip. Experience matters, but what type of experience? At this point, we’ve essentially debunked the notion that a content writer needs prior industry knowledge in order to succeed, right? 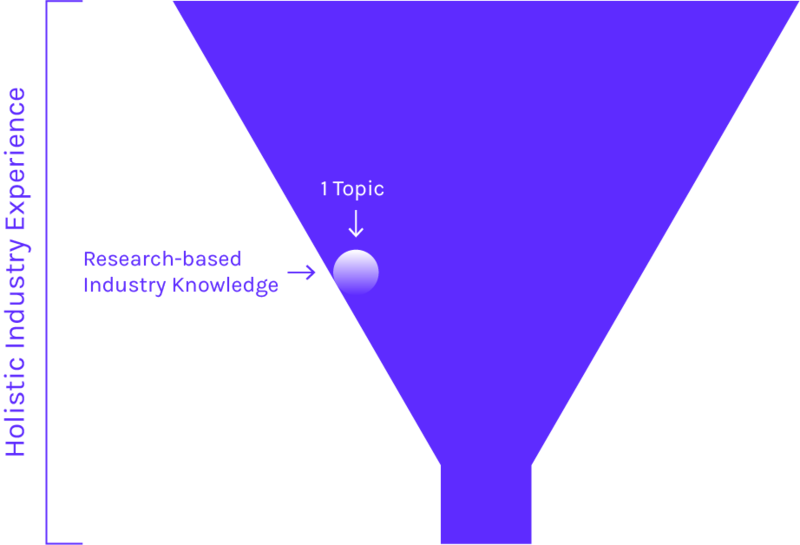 Earlier, we looked at a graphic of a funnel that demonstrated the small segment of research-based industry knowledge necessary to create a winning piece of content. Content writers learn as they research—and that knowledge compounds over time. SEO insights over time lead to content that is even better suited to earning backlinks and nailing searcher intent. Let's say a content writer produces two pieces of content per month—including extensive SEO and topic research. After 6 to 12 months, it would be difficult to still call them an industry novice with a straight face. Long-term relationships with SEO companies increase the depth of knowledge writers can draw from. The content development process doesn’t stop when a post is published. Content marketers leverage data to monitor performance and make adjustments to content as necessary. These changes can be anything from minor tweaks to title tags and meta descriptions to full-blown revisions a year or so after going live. Sure, the two go hand-in-hand, right? Industry research as it pertains to specific content and SEO opportunities. Developing expertise on a very specific topic. It’s no cakewalk, but it works—and it answers the crucial question you’ve heard (or asked) a million times.